Biddenden is a small village near Tenterden, in the Weald of Kent. There are some lovely old medieval buildings on the cobbled High Street, and interesting medieval brasses in the church. 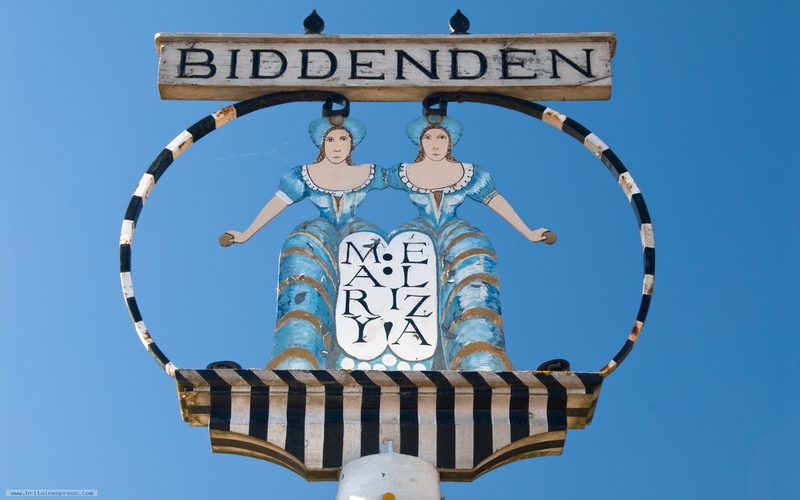 The most memorable bit of Biddenden heritage, though, is its association with the 'Biddenden Maids' as remembered in this village sign. The Biddenden Maids were a pair of 12th century Siamese twins from Biddenden. They died within a few days of each other, and in their wills left land to provide for an annual dole to the poor of the parish. This 'Biddenden Dole' of bread, cheese, and biscuits bearing the likeness of the Maids, is still distributed on Easter Monday to anyone who asks for it.